Coffee in the morning is an important part of the daily routine. Over the years become more about quality than quantity. There was a day when a pot of coffee meant one cup for Renee' - 15 cups for me (when all's said and done). Moderation in everything, including coffee, is a better and healthier rule. At the end of the day, life is too short to drink bad coffee. Weniger aber besser - Less, but better. 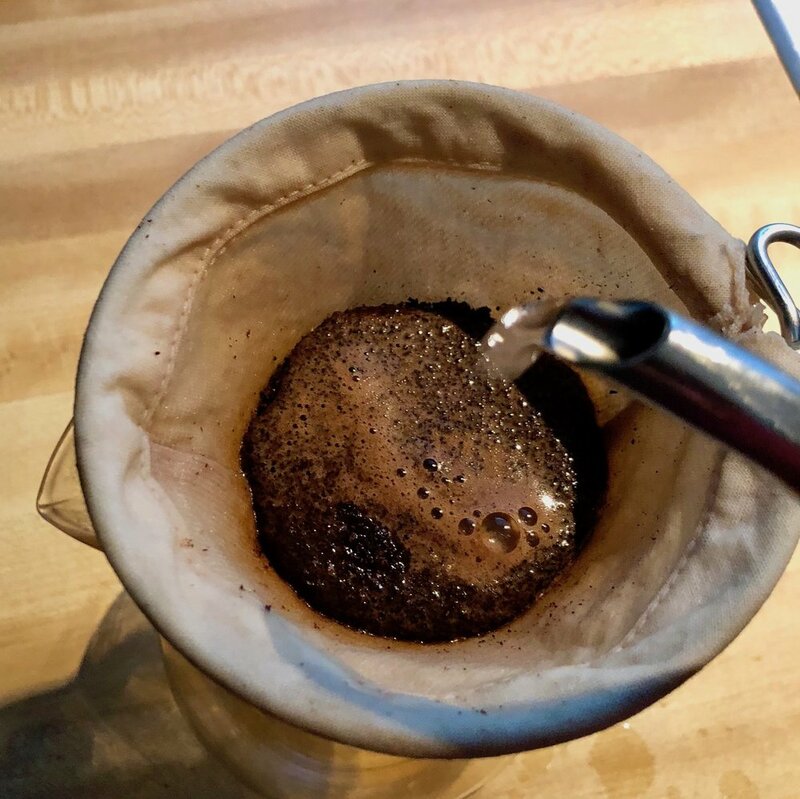 Since it is neither convenient or prudent to go to a coffee shop every day, I do take time every morning to make myself an outstanding cup of coffee. As I was thinking about today's "Coffee Shop Saturdays" post, I was brewing today's mug. So why not show the process? I've used one of these almost every morning for the past for the past 8 years and I love it. 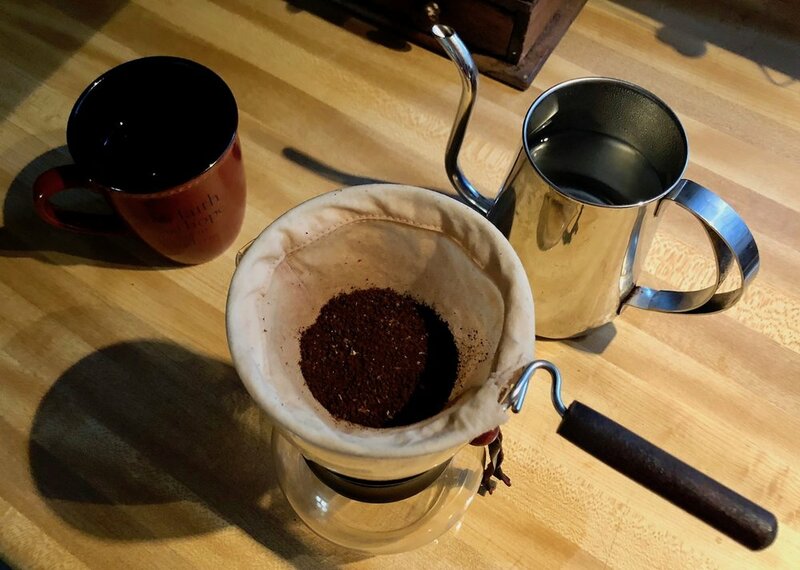 With a little experimentation, it's easy to perfect a perfect cup of coffee. The reusable cloth filter means there's never weird filter flavor. I do a new filter every three months. This means I only buy a package of filters about once per year. You could Change them more or even less frequently. This is just the pattern that works for me. Water boilers are common counter-top appliances in Asia (and many other parts of the world). Not so much in American - but it is at the Anderson home. Mainly because I refuse to own a standard drip coffee maker. Replace one appliance with another - plus paraphernalia. Makes sense to me. This was a yard sale find. I find this doesn't grind as fine as necessary for a good espresso pull, but it's a decent grinder. And we can't beat the price (I think it was $10 bucks at a yard sale). The important thing is to invest in a burr grinder. This is really important for good, home-brewed coffee. Whirly-bird coffee grinders heat the beans and are nearly impossible to regulate. The process of making a great cup of coffee first thing in the morning engages my head. It sets me up for a morning routine (for me that's quiet, reading, and writing - or QRW, as it reads on my daily calendar.) I realize this isn't for everyone. Many like their mornings more automated. I get that. I like morning time to be more process-oriented. Which makes me wonder if there are two kinds of "morning people"? Something to explore another day. What's your morning coffee (or other hot drink) routine? I know it feels a little banal, but I find this an interesting connecting point between human beings. Are you an Aeropress, automated drip, hot tea, or Quickstop person? Leave your morning coffee/tea/hot drink ritual in the comments.